Whilst it was his superb second goal that grabbed all the headlines on Tuesday evening, there was almost as much to admire about Sam Hoskins’ coolly-taken opener during Town’s 2-1 win against Tranmere Rovers. Hoskins’ second at Prenton Park, a wonderfully deft first-time flick from David Buchanan’s cross, was undoubtedly the better goal but it was all about instinct. He didn’t have time to think about it. His first, by contrast, required composure and a calm head. Confronted by home stopper Scott Davies after skipping past last defender Sid Nelson, in times gone by Hoskins may have panicked and rushed his shot. But not on Tuesday. 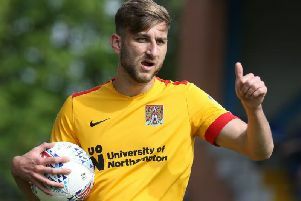 The 26-year-old, who celebrated his birthday the day before, kept his nerve and coolly slotted through the legs of Davies to put Cobblers in front with just 90 seconds gone. “Before the game I was told to stay on the defender’s shoulders because if I get in behind them I’d be able to beat them for pace,” explained Hoskins. It was a good cross from Buchs, I didn’t have the time or space to take a touch and control the ball so it was about helping it on and aiming for the far post as much as anything. The battle between the respective strikers on Tuesday evening hardly seemed a fair fight given Tranmere’s James Norwood had 18 league goals ahead of kick-off - more than anyone else in the division - compared to not a single one for Hoskins. But whilst Norwood did add to his tally by bringing Rovers level midway through the first-half, he was to be outdone by his opposite number, who bettered his first goal with a sensational second, producing a backheel flick which looped over Davies and into the far corner. “The gaffer is always keen for me to get across the front stick,” said Hoskins. “It was a good cross from Buchs, I didn’t have the time or space to take a touch and control the ball so it was about helping it on and aiming for the far post as much as anything. “It came off perfectly and it was a very good time for us because we were under a lot of pressure but we took a lead into half-time. “It’s a really good win. It’s not an easy place to go to on a Tuesday night, especially after Saturday’s game because that was a massively disappointing result at home. “We knew we had to bounce back as a team and obviously it’s pleasing on a personal note to get a couple of goals. Hoskins is under no illusions that his goal return hasn’t been good enough. Indeed, his goals on Tuesday were his first in the league all season. “I need to start scoring more,” he admitted. “I know myself that my goal return hasn’t been good enough and I’m my harshest critic. The Town forward now hopes he can retain his place in the side for Saturday’s game at leaders Lincoln City, although manager Keith Curle joked on Tuesday that his desire to tinker would see Hoskins dropped. The former Southampton man added: “The manager picks the best XI that he feels will go and win the game. It’s down to him to make those decisions now but it was a good performance all-round so he’ll have some tough calls to make all over the pitch.